Mitsui Sumitomo Insurance Company, Limited ("MSI", President: Noriyuki Hara), a subsidiary of MS&AD Insurance Group Holdings, Inc. ("the Company", President: Yasuyoshi Karasawa), today announces it has reached an agreement with Fairfax Financial Holdings Limited (“Fairfax”) to enter into a global partnership and to acquire First Capital Insurance Limited ("First Capital Insurance"), Singapore’s largest commercial property and casualty insurer ("the Acquisition"). MSI will enter into an agreement and explore a broad global partnership with Fairfax in various areas including reinsurance relationships that would lead to successful growth and value creation for both parties. MSI, as well as the Company, is working to grow enterprise value through sustainable growth, ensuring financial soundness, enhancing profitability and improving capital efficiency, based on the medium-term management plan "Next Challenge 2017." Our international business is positioned as a growth engine to support these efforts, and we have been working to increase stable profits and spread risk through diversification of our portfolio and by continuously investing in areas of high profitability and growth. Based on this strategy, we have rapidly grown to become the top non-life insurer (as measured by direct written premiums) in the ASEAN region and expanded our operations centered on Asia, building on the momentum from our acquisition of the Asian non-life insurance operations of UK company AVIVA, in 2004. We are further strengthening our revenue base through significant efforts in emerging markets where future growth is expected and we have increased our presence in Europe and the US, major insurance markets, by developing direct insurance business in Continental Europe and acquiring Amlin plc in February 2016. 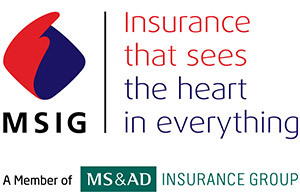 In order to maintain and strengthen our leading position in the ASEAN region as well as to complement our existing operation and achieve synergies, MSI will acquire First Capital Insurance, one of the leading players in the Singaporean non-life insurance market. This acquisition price represents a book value(Note 1) multiple of 3.3x. Acquisition Financing: The funds for the Acquisition are to be provided from cash on hand(Note 2). Time of Completion: Subject to the receipt of approvals from the relevant regulators, completion is planned to occur in the fourth quarter of the fiscal year (i.e., January 2018 to March 2018). * In these materials, we calculate figures using exchange rate of 109 yen per USD. (Note 1) As of June 30, 2017. 80 yen per SGD. (Note 2) The company does not intend to raise equity-finance for this transaction. First Capital Insurance is the largest property and casualty insurance company in the Singapore market in terms of gross written premiums and a leading player in Singapore with annual profits of approximately JPY 7 billion. First Capital Insurance has strengths in underwriting corporate/commercial risks located in the ASEAN. First Capital Insurance has maintained high profitability with a five-year average combined ratio of 76% and ROE of 15%. In addition, First Capital Insurance has diversified underwriting risk portfolio across geographies and products with limited exposure to natural catastrophe risks. First Capital Insurance has strong and stable relationships with clients, reinsurers and brokers, under a company philosophy that values trusted relationship with business partners. The acquisition will enable us to become a No.1 insurer in Singapore non-life insurance market. The acquisition is highly complementary as First Capital has a strong presence and underwriting capability in the local corporate market which fits well with MSI who has a competitive advantage in retail and SME business. MSI is the only non-life insurance company in the world with operations in all 10 ASEAN countries, and has the largest market share in terms of GWP for non-life insurance. First Capital Insurance is a leading insurer in the ASEAN region in term of both GWP and profit. By acquiring First Capital Insurance, we can also cement our position as the No.1 in the ASEAN region. In addition to its strengths in underwriting local commercial risk in Asia, First Capital Insurance has growth strategies in the retail business by utilizing digital technologies. By integrating the capabilities of First Capital Insurance and MSI’s network in the region, we can expect new business opportunities in the local corporate and retail market in Singapore as well as other Asian countries. Fairfax is a holding company which, through its subsidiaries, is engaged in property and casualty insurance and reinsurance and investment management (Total premium income of approximately 1 trillion yen.). Fairfax has insurance and reinsurance operations globally, with a presence in more than 30 countries, with great presence in North America and the Lloyd’s market. Fairfax also owns FairVentures that conducts research and development of digital technologies enabling application of these technologies to its insurance business globally. The global partnership with Fairfax, in areas including reinsurance and digital technologies, will enable further growth in our overseas businesses.